The three cultures at the center of the songs on this recording make a joint appearance in the finale of the Siete cantos de España. They are formed into a unified whole in Ensalada, as the soprano and the baritone begin singing together texts of Castilian, Sephardic and Arabic origin. The poems’ subjects are love, agony and death; and in order to bring them to life Halffter requires a large orchestra of about 100 musicians and two soloists with the baritone singing Spanish texts and the soprano all others. Siete cantos de España exhibits “all the distinctive features of Halffter’s writing for orchestra and the human voice: complete flexibility in tempo and measure, stark contrasts in dynamics, the alternation of controlled and open segments throughout the seven parts. 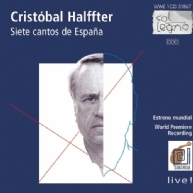 … Let us therefore enjoy and marvel at these Cantos de España, which have emerged from the cultural consciousness of ancient Spain; even today … they can feed us with their spiritual energy.” (Guillermo García-Alcalde) The live-recording of the premiere conveys all these qualities most vividly, thanks to the excellent interpreters, with Halffter conducting. The intensive piano works of Arthur Vincent Lourié, played by Daniele Lombardi. Musica Viva 04: Pierre Boulez as conductor – in a musical discourse among antiquity, middle ages and classical modernism.